Mediterranean Feels! Luxury 11 Bedroom Home, Dual Outdoor Grill! Our stunning Adonis vacation home is a Mediterranean-style beach villa, exclusively located in the coastal community of Frangista Beach. This community is located directly in the middle of tropical excitement with shops, shoreline restaurants, and beach access within walking distance. Guests will be able to enjoy the sugar white sands of the Emerald Coast with the added bonus of peace away from the crowd. This 5,200 sq.ft. home has 11 bedrooms, 12.5 baths and sleeps up to 28 people. Adonis also features many common areas that are perfect for gatherings of any size. The luxury experience of Adonis begins immediately upon entering. Following an inviting living space is a gourmet kitchen finished with top-of-the line stainless steel appliances, granite countertops and plenty of dishware for over 30 people. Near the kitchen is a large dining table nicely lit by a chandelier. Additional seating is located at the breakfast bar, pool area, and outdoor dining space. Also located on the first floor is a media room that provides comfortable seating and a 60” flat-screen TV with surround sound speakers. Off of the living and dining area is a King Suite that sleeps 2 and has a private bath. Entering the second floor, guests will find a set of bedrooms that are connected together from one hallway to the next. The first of these bedrooms is a custom-made bunk room with a fun design and color scheme, one full-sized bed, and 3 twin-sized beds. This room is perfect for children, teens, and young adults. Connected to the bunk room is a queen bedroom that is bathed in sunlight during the daytime and shares a bathroom with the bunk room. The third room connected along this group is another queen bedroom. There are 3 additional bedrooms on this floor. The first being a custom-made bunk room with 2 twin-over-full sized bunks and a private bathroom. The other 2 rooms are King Suites, each with their own private bathrooms and private balconies. A laundry room is conveniently placed on this floor, as well. The second floor sleeps up to 18 guests. Following the staircase to the third floor are four King Suites. The ornate and regal decor will have guests resting in a state of luxury. Each room features their own private bathroom and personal flat screen TVs. One of the four rooms features its own private balcony. The third floor also features a game room that is perfect for indoor family fun on rainy days. This room includes a pool table, kitchenette, wet bar, and an additional bathroom. The third floor sleeps 8 guests. Adonis features a beautiful private, 15 x 21 ft. pool facing West. There is also a wading pool for small children that is perfect for giving little ones a chance to safely enjoy playing in the water. Offering an abundance of sunshine, the pool deck is also perfect for peaceful sunbathing on the lounge chairs. The neighborhood of Frangista Beach consists primarily of large homes where families come to vacation. It spans the equivalent of approximately four blocks. The neighborhood has a 400 yard private beach which you must have a code to access. 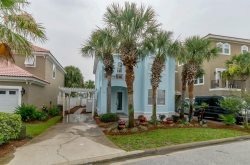 This home is within walking distance to a coffee shop, a deli, fast food options, and favored local restaurants such as Pompano Joe’s and Whales Tale. Frangista Beach is also home to Emerald Coast Wine Cellars where you can sample and purchase wines made exclusively in Florida. A large Winn-Dixie grocery store is 1.5 miles to the East and alongside it you will find the luxurious Silver Sands Premium Outlet stores where you can partake in a quiet and enjoyable shopping experience. For those with children, Silver Sands Premium Outlets is home to a Disney Store which will surely bring joy to any child or Disney-lover. Frangista Beach has a rich history that began when a family from Greece built a small motel and, subsequently, a little white chapel that still stands to this day. Many brides are married on the Frangista Beach and use the magnificent chapel for photoshoots. After visiting this neighborhood, you will understand why so many families choose to return year after year. *Weddings/Events – If held on the property or private beach an additional $500.00 HOA fee is required for permit. Please note tents and canopies are not allowed on private beaches due to HOA regulations. *Frangista Beach Homes — Only homes located within the Frangista Beach HOA are not subject to the separate Walton county Permit. Only Beach Reunion's $500.00 event fee. Private Pool-The pool can be heated from October 1st through May 1st $50/Day or $350/Week. Please note there is an additional fee to heat the pool. Seasonal Beach Chair Service - Our complimentary seasonal beach service is offered for our Summer months only. This includes 2 chairs and 1 umbrella set up daily on the beach from 9am-5pm. Please contact our office for exact dates. They do change from year to year. Free beach chair service included from May 12th - August 10th, 2019.